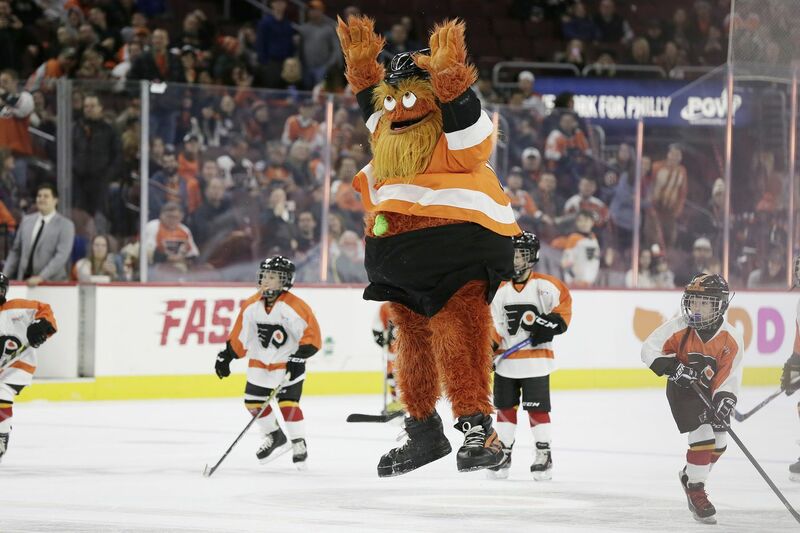 Last October, as Philly was gripped by national mania surrounding its newest celebrity —the Flyers’ fuzzy, tangerine-hued mascot, Gritty — a Facebook event organized by Grittynhl instantly caught the attention of his booming fan base. “We will gather dressed as the thing himself and run, drink, and celebrate his arrival to Philly!” the original event description proclaimed. A costumed run around the Wells Fargo Center would be the pièce de résistance of the affair. I already started my training... did you? Yo Adrian! It promised chaos. It looked messy, kind of like Gritty himself. And enthusiasm for it was overwhelming. Thousands of RSVPs flooded in, then tens of thousands. One fan said it was her “wildest of dreams coming true.” Others posted photos of the costumes that they had painstakingly created. (At least one pet was stuffed into a Gritty costume.) Two Gritty aficionados even re-created the now-famous picture of the Flyers mascot recreating Kim Kardashian’s “Champagne Incident” cover. But people also had questions. Was this a 5K or more of a pub crawl? Did you have to pay? Grittynhl answered sporadically, offering vague promises of details. Every now and then, organizers posted training-themed Gritty photos to build excitement. And yet, as Jan. 12 grew nearer, no specifics were offered. “This smells like bulls— to keep us engaged,” wrote one particularly incensed fan. People were getting antsy and starting to call the event fake, despite over 20,000 people marking themselves as “going.” Sometime in early January, organizers postponed the event — until March 2028. Fans responded with cautious optimism and occasional outright skepticism. “I feel like Gritty is giving me trust issues,” one woman wrote. “I would imagine that it’s next to impossible to plan a run in only a month and a half,” one fan commented on Jan. 29 after his request for a sign-up page went unanswered. The Inquirer repeatedly reached out to the Facebook event organizers and the Flyers for confirmation, but did not hear back from either. Joe Heller, vice president of marketing and communications for the Flyers, confirmed that the team had been in contact with the event organizers at one point, but that the team had opted out of participating because of scheduling conflicts. “We hope to make something happen next year, though,” Heller said. Staging a run in Philadelphia is no easy task, which is perhaps why the Gritty event has stalled. If any part of the event takes place on city-owned or occupied property — including road closures — organizers have to work with the Office of Special Events and the police to ensure they have the necessary licenses, insurance, and permits. They must provide an estimated number of attendees, food and beverage information, and whether they’ll rent equipment from the city. “That part of the process takes two to three months,” said Sandy Frenia, race director of the Philly Cupid’s Undie Run, which took place for the seventh time Saturday outside World Cafe Live. And that timing estimate bars any unforeseen obstacles, Frenia said. At this point, most fans who were planning to attend the Running of the Grittys have accepted that it’s probably not going to happen. Flanagan made a costume for the run that he’s planning to wear to the Philadelphia Fusion season opener at Xfinity Live! on Thursday.